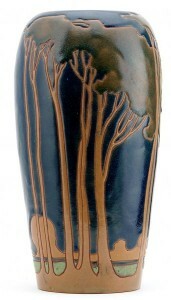 Pictured left: An Earthenware Vase – Maria Longworth Nichols and Albert R. Valentien for Rookwood, 1883. In the dull finish, decorated with a frog conducting a choir of ducks amidst Oriental grasses, chased around the neck and foot with a fire-on-gold honeycomb motif, signed in gilt MLN, incised A.R.V. and impressed Rookwood 1883 Y 162 with the kiln and anchor mark, and with remnants of paper label. 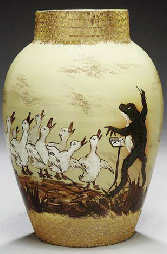 Sold for $9,400 at Christies, New York, 2001. The term “American Stoneware” refers to the predominant houseware of nineteenth century America–stoneware pottery usually covered in a salt glaze and often decorated using cobalt oxide to produce bright blue decorations. Pictured left: Fenton & Hancock Water Cooler sold at auction for $88,000 in Nov 2006 at Crocker Farm Inc auctions – image courtesy of Crocker Farm Antiques. The town of Bennington in what is now the state of Vermont was chartered on January 3, 1749 by Colonial Governor Benning Wentworth and named in his honor. The tradition of pottery-making inh the area is largely the legacy of Capt. John Norton (1758-1828) who began producing “redware” glazed pottery in 1784. The Bennington area was close to local clay deposits, as well as deposits along the Hudson and the River. Bennington could supply waterpower to power the associated machinery. The first kiln appeared in 1793. The first stoneware was produced in 1804. Pictured right: Two Stoneware Items – The crock E & LP Norton, Bennington, Vermont, 1858-1881, the jug J & E Norton, Bennington, Vermont Comprised of a six-gallon double-handled cobalt-decorated stoneware crock with bird and floral decoration and a three-gallon double-handled baluster-form cobalt-decorated stoneware jug with peacock decoration. The crock stamped E&LP Norton Bennington VT 6, the jug stamped J. & E. Norton Bennington VT 2 The crock 13½ in. high; the jug 12 in. high. Sold for $3,250 at Christies, New York, 2008. Other potteries were founded in the area, most notably the United States Pottery of Bennington, founded by Christopher Fenton in the 1840s. Throughout the 19th Century the potteries achieved considerable success employing hundreds of people and even representing the nation’s pottery industry at the 1853 Crystal Palace Exposition in New York. The high standards achieved and variety of successful forms produced was copied throughout New England. From the late 19th Century a move away from stoneware in the marketplace meant that the pottery business in the Bennington area began to decline and by 1948 had nearly died out. However, the tradition of pottery making in Bennington still continues led by David Gil who began making ceramics as part of an artists’ cooperative and eventually opened Bennington Potters.